You’ve heard about the terms header, sidebar, footer, nav bar etc. but no sure what they mean? Okay I’ll try to explain. The terms refer to the parts (the anatomy) of a blog. If we know the names, then it is easy to find more information about it on the internet. Header –header usually consists of two components, your blog title i.e.. name of your blog, and the description –a sentence describing the contents of your blog. 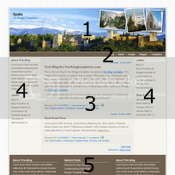 Nav bar -navigation bar, besides Blogger default nav. bar on top of the page (but many outsourced templates hide this bar) there is also a nav. bar usually below the header. Here you can put links to articles inside your blog or to other blogs/websites. Main post –this is the area where your post is displayed. You can choose how many posts to be displayed at one time. Sidebar -sidebar usually contains widgets. Widgets are sort of accessories that complement your posts. They can be added or removed easily. Commonly used widgets are Link List, Blog list, Categories and Archive. Many more widgets are available in Dashboard>Page Elements>Add Gadget menu. I will write about installing widgets in my future post. Footer –actually a footer is just like a sidebar. It is usually under-utilized. Free template designer usually puts their link here. Okay one more thing, every blog has an "About Me" thingy. Write a little bit about yourself here. You want visitors to be able to relate you with your blog subject/content. Let say your blog is about car repair DIY, then it wouldn’t hurt at all if you are a mechanic, is it? 0 comments to "Getting to know the parts of a blogger blog"